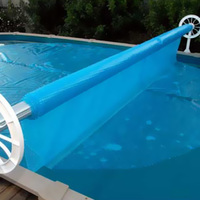 A HydroTools™ Solar Reel helps you to roll your blanket on and off the pool, quickly and easily. All HydroTools™ Reels include adjustable blanket fasteners, a quality protective cover and flexible fittings that make installing and using your pool cover and reel, easy! For very large commercial pools, we have a range of reels with anodised aluminium tube sizes up to 200mm (8") diameter. These reels are usually supplied with corrosion resistant stainless steel castors allowing relocation of the reel from the pool area when in use..